July 26, 2017 | 1:30 p.m.
Blueberry maggot fly infestations can often go unnoticed until harvest. The blueberry maggot fly (Rhagoletis mendax Curran) was first detected in Wisconsin during the summer of 2016, and the species is now considered established in the state. This agricultural pest, which is closely related to the well-known apple maggot (Rhagoletis pomonella), regularly damages commercial blueberry production in the eastern and southern United States and eastern Canada during the growing season. It is expected to have a significant effect on the blueberry industry in Wisconsin. The adult blueberry maggot fly looks somewhat like a small housefly with dark bands on its wings, and is very similar in appearance to the closely related apple maggot. Despite their virtually identical wing pattern and appearance, apple maggots do not use blueberries as a host. Therefore, flies trapped in blueberries are most likely to be the blueberry maggot fly. While the blueberry is the only commercial crop affected by this species, wild berries used by the maggots include lingonberries, dangleberries, deerberries, huckleberries and wild blueberries. Adult blueberry maggot flies begin to fly in June or July, and remain active through August. They mate and move into blueberry fields after feeding for at least a week. A mated female will lay a single egg under the skin of each of up to 100 nearly ripe blueberries during her approximately month-long life span. The blueberry maggot fly is a newcomer to Wisconsin. The blueberry maggot fly egg hatches within a week. The larva, or maggot, is legless and has a single hook-like tooth for a mouth. A single larva feeds entirely within a single blueberry during its two to three week development, causing the host berry to become soft and watery. Damage generally first appears in mid-July, and continues until blueberries have been harvested. Unfortunately, this infestation can go unnoticed until after harvest, when maggots crawl out of the fruit and their presence becomes obvious during processing or when it's sold fresh. After completing development, the larva drops to the ground and overwinters as a pupa in the upper few inches of soil. One distinctive characteristic of the blueberry maggot fly is that, although most pupae emerge the following spring, some will remain underground for two or three years. 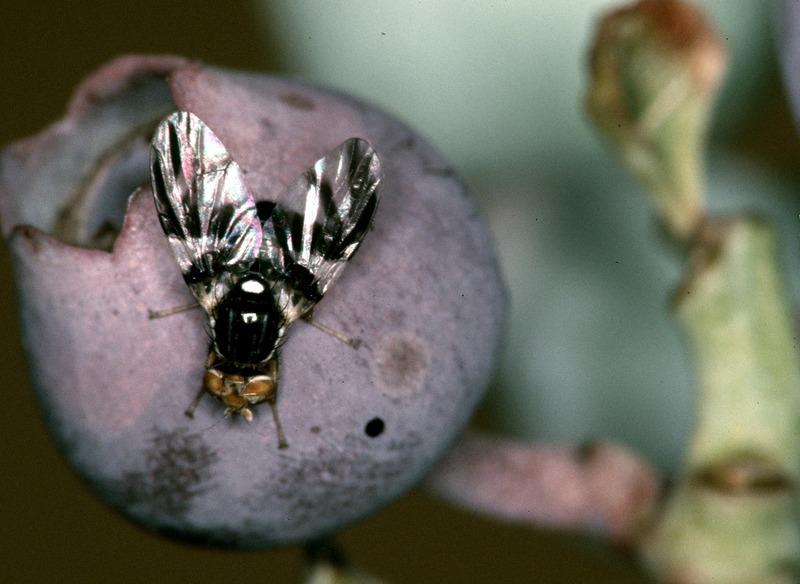 For this reason, spraying to control blueberry maggot flies one summer will not necessarily eliminate a given population, as there will often still be some pupae in the soil to emerge in following summers. Removing weeds in a blueberry patch, as these can provide a habitat for maggots. Removing wild blueberry and huckleberry bushes near plantings. Harvesting thoroughly, and solarizing or freezing any damaged or unsalable fruit. Crop waste should never be composted without first solarizing it, as blueberry maggot pupae can survive in the compost and infest crops in future years. Being careful to clean soil away from any equipment or honeybee hives that are moved between blueberry farms, so as not to introduce blueberry maggot pupae in the soil. Chemical control is recommended when blueberry maggot fly traps yield an average of more than one adult per trap for multiple days in a row. In general, spraying should be conducted roughly one week after the first blueberry maggot flies appear in traps, and continue every seven to 10 days through harvest. Multiple insecticides are registered for use in blueberries in Wisconsin — their label directions should always be followed to conform with the most up-to-date legal requirements and recommendations. In Wisconsin, the blueberry maggot fly has only been confirmed in Adams and Sauk counties so far. However, its range is expected to expand in coming years. If blueberry maggots or signs of infestation are found, the University of Wisconsin-Madison Insect Diagnostic Lab should be notified. Janet van Zoeren works as a fruit crops associate with the University of Wisconsin-Extension. Christelle Guédot is the fruit crop entomology specialist with the University of Wisconsin-Extension and UW Fruit Program, and an assistant professor in the UW-Madison Department of Entomology. This article is adapted from an item originally published in Wisconsin Fruit News, Volume 2, Issue 1, a publication of the Fruit Crops Team.